Felix the Cat of cartoon fame carried a magic bag that he transformed into anything he needed, from a car to an airplane to a parachute. Researchers at Sony Corporation are bringing the notion of transformability to user interface devices with a control knob that the user can reshape to change its function. The researchers' Haptic Chameleon is a video control knob that a user can switch to round, rectangular and semicircle shapes that have different functions and different force feedback effects like hard stops or changes in resistance. The prototype knob consists of two semicircles divided by rectangle. The user can depress one of the semicircles to change the knob shape to a semicircle, or both semicircles to change the knob to a rectangle. The round shape, which moves in fine-grained increments, allows a user to navigate a video frame-by-frame. The rectangular shape, which has coarser increments, allows the user to navigate scene-by-scene. And the semicircle, which symbolizes happy or sad scenes through its resemblance to a smile or frown, allows the user to move between scenes of a certain type. The combination of a tangible interface of objects whose shapes corresponding to functions and a haptic interface that provides force feedback allows the user to create a mental match between the shape of the device and the function or mode of operation associated with it, said Georg Michelitsch, a principal scientist at Sony Corporate Laboratories Europe. Eventually devices based on the technology could change shape to mimic real-world objects, mimic interface devices like joysticks, or form symbols like a square that represent functions like stopping video, according to the Michelitsch. The researchers are initially aiming to use the device for automobile and home entertainment controls, said Michelitsch. "Any application scenario that requires the user to focus his or her eyes on something [other] than a graphical user interface will benefit from... Haptic Chameleon technology," he said. When people experienced with video editing tools tested the knob, they liked the concept of combining multiple controls in one device, according to Michelitsch. The simple video navigation application "showed that a single, shape-changing control... can replace many traditional controls such as buttons and dials," he said. The researchers also tested a virtual version of the knob generated by the Phantom virtual reality input device. The Phantom consists of three, thimble-like finger harnesses attached to arms that sense the user's finger positions and provide force feedback. 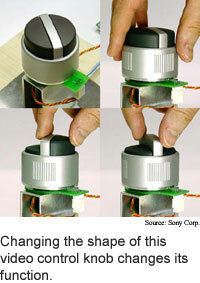 Users manipulated a graphical representation of a video control knob and changed its shape by squeezing the virtual knob. The virtual device provided a better shape-changing experience than the mechanical Haptic Chameleon knob, but lacked the realistic grasping action required to use the mechanical device, according to Michelitsch. The researchers are investigating several emerging materials with an eye toward improving the shape-changing effect in real knobs. They are looking at electro-active polymers, which are plastic or rubber materials that change shape in the presence of electric fields or currents, and magneto rheologic fluids, which change viscosity in the presence of magnetic fields, said Michelitsch. Ultimately, the researchers are aiming for a device that can be molded as easily as clay. "We would like to be able to create Haptic Chameleon user interface controls that the user can mold smoothly into almost any shape you can imagine," he said. The researchers are also aiming to use the technology for mobile devices like cellphones and handheld computers, said Michelintsch. This will require controls that use little power, he said. Applications like the video controller are feasible now; more sophisticated applications are likely to take two to five years, said Michelitsch. Michelitsch's research colleagues were J. Williams, M. Osen, B. Jimenez, S. Rapp. They presented the research at the Computer Human Interaction (CHI) 2004 conference in Vienna April 24 to 29. The research was funded by Sony Corporation.